As a member of the first generation to really embrace both tattoos, I’ve seen a lot of weird body art. However, my generation is also the first generation to really embrace video games, so it’s only natural that the two should meet eventually. 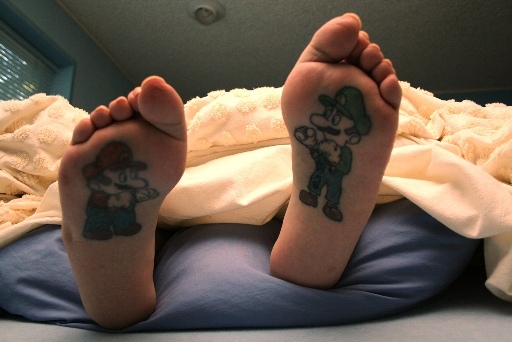 Take, for example, these excellent tattoos of Mario and Luigi from Nintendo’s Super Mario franchise gracing the bottoms of someone’s feet. Weirdest Super Mario Brothers tattoo ever? I think they just might be. However, that’s nothing compared to the weirdness of this bizarre-looking Super Mario-themed advertisement I found this morning for Shaktronics. Looks to me like Luigi’s been hitting the Italian buffet a little too often! The first video game tattoo I ever saw in real life was on a friend of mine named Yoshi, who I met in college. Of course he had Yoshi tattooed on his calf. I have another friend who has a full arm sleeve of horror movie characters, but that’s not as unusual as movie characters are very popular inspirations for body art. It’s crazy what people will put on their body!